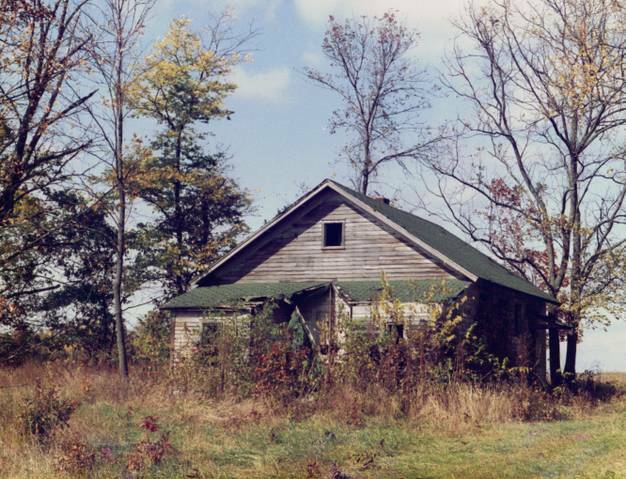 The Mahon Schoolhouse in Otego Twp near Brownstown, IL. My mother attended school here in the 1920s and early 1930s. This photo from the 1990s has hung in my office for a long time. The schoolhouse has since collapsed. A few years ago my family and I visited Ireland. At the Blarney Castle gift shop (yes, we all kissed the stone! ), I purchased keychains for myself and Mahon relatives in Illinois. I asked the clerk, “How would you pronounced that name?” She looked at me puzzled but said, “MAY-on.” I explained that I was from the states and we said it, “ma-HON,” but I hadn’t been sure if that was the Irish pronunciation. The Mahons are my only Irish family—handy credentials when I first met one of my best friends, who is Irish Catholic to his bones. 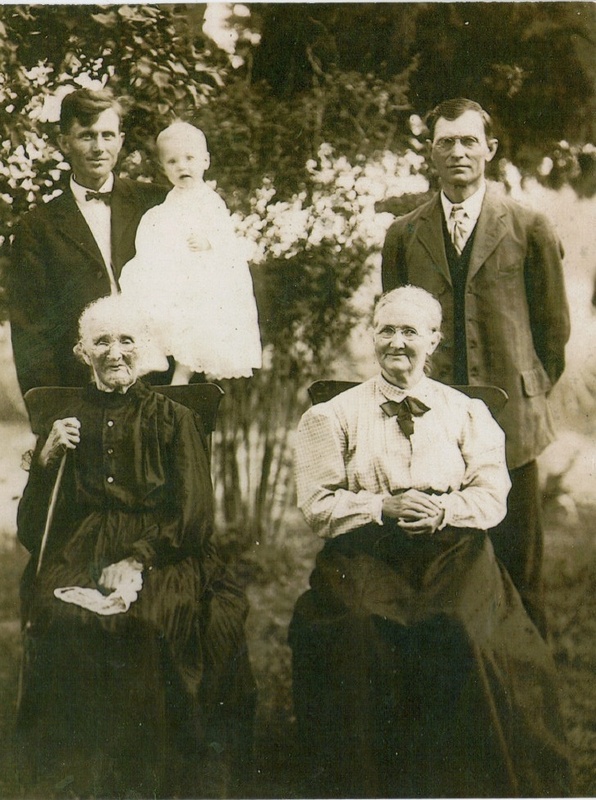 My great-great-grandmother was named Caroline (Mahon) Crawford, 1844-1921; I write about the Crawford family here. She is buried in the Pilcher Cemetery, beside her husband Andrew, and also among most of his siblings and not far from her (Caroline’s) brother Jacob Mahon (1856-1877). One of my hometown friends is a fourth cousin via Jacob and half-second cousin through the Strobels! Family connections are always fun to make. I actually have a lock of Caroline Crawford’s hair. Grandma Grace (the source of nearly all my information about and appreciation of family history) said that it was saved when Caroline died. 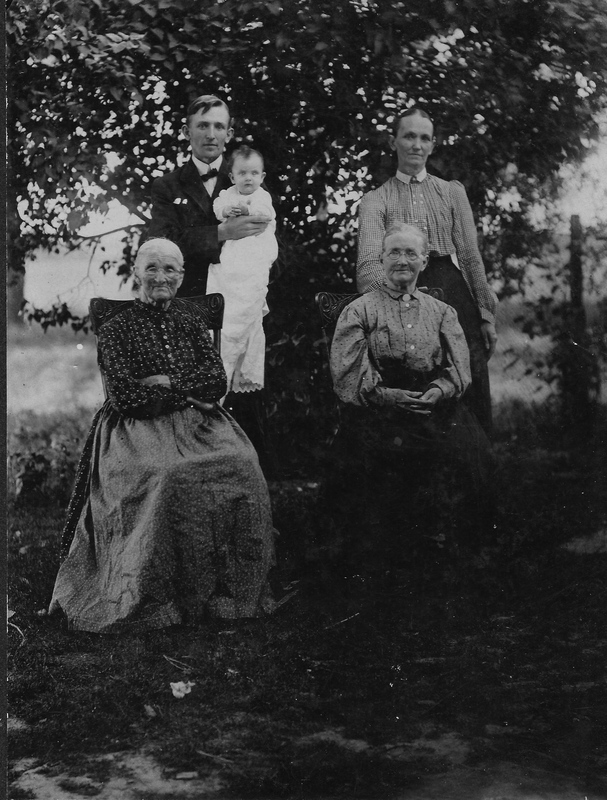 Caroline sat for two five-generation photos in 1909, although Grandma said that Eliza didn’t want to pose very badly. John and Eliza are buried in the German Reformed Cemetery, on IL route 185 southeast of Vandalia. Grandma said that John only wanted a rock for his grave because that is all Jesus had. But several years ago, Mahon relatives helpfully placed a dated marker on their graves. Among their children were Caroline and Harriet (who married Crawford brothers), and Jacob. (The rest of this material comes from Mr. Robert Mahon, a St. Louis cousin whom I met in 1974 and who had traced a lot of the family.) John Mahon’s parents were Doctor and Dolly (Lansford) Mahon. Doctor lived 1786-1860, Dolly from 1787-1860. Eliza was a daughter of Dollly’s brother Isham; so she and John were first cousins. Mr. Mahon told me that Doctor and Dolly were probably buried in Wilbertown Township of Fayette County but no one knows where. Doctor had five brothers, James, Thomas D., Pleasant, Barrett, and Dennizen. (I know: some of these are unusual names!). According to Mr. Mahon’s notes, “John’s six sons were in the Cascade, Virginia, area by 1790. James may have settled near Bowling Green, Kentucky. Doctor and Thomas came to Illinois. Pleasant stayed in Virginia but his son, Wesley, came to Illinois and raised a large family there. Little record of Barnett and Dennizen.” Thomas was a veteran of the Revolutionary War. My high school classmate (and sixth cousin) Sherry has done a lot of research about this, her ancestor. 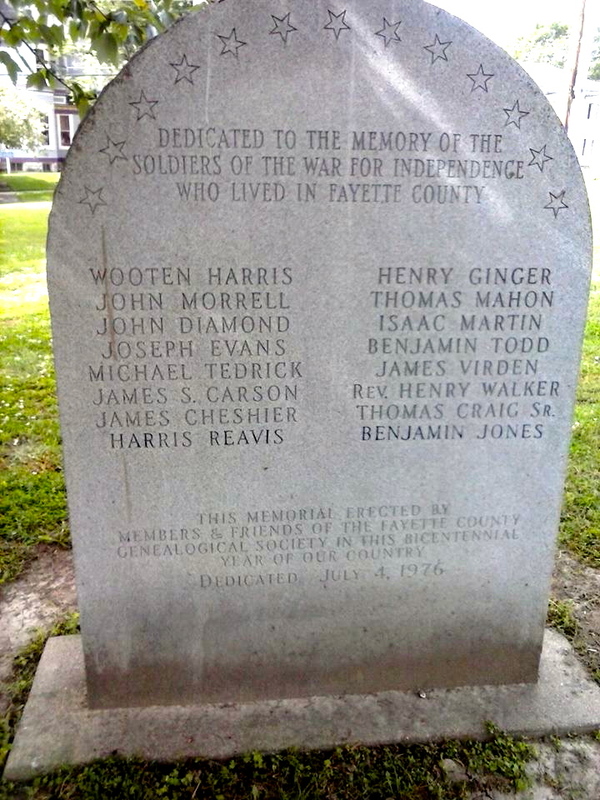 Thomas is honored in Vandalia with his name on the memorial to locally-buried Revolution veterans (which includes one of my Carson ancestors). Thomas Mahon’s Find-a-Grave page is here. Those six brothers—Doctor, Thomas, James, Pleasant, Barrett, and Dennizen—were the children of John Mahon and his wife, Jane Byrd (or Dial). John Mahon was our Irish immigrant ancestor. He settled near Fredericksburg, VA in the early 1700s. According to Mr. Mahon’s notes, “John was killed when he resisted British as they ransacked his home.” I wonder if that’s a story, similar to my other ancestor Paul Crawford supposedly being killed by Indians, especially since Doctor was born after the end of the war. But it still makes a good family story. Another 1909 photo of Eliza Mahon and her daughter Caroline Crawford, with Caroline’s daughter Alice Rush, Alice’s son Andy Rush, and Andy’s daughter Ruth. Paul, My current theory on the Mahons (I am one) is they were Scottish- not Irish. I think they paused for tea in Ireland but were really Scottish.